STRAPLESS, ORGANZA , MERMAID WEDDING GOWN WITH A SWEETHEART NECKLINE AND ASYMMMETRICAL PLEATING WITH JEWELED BEADING ON THE SIDE. 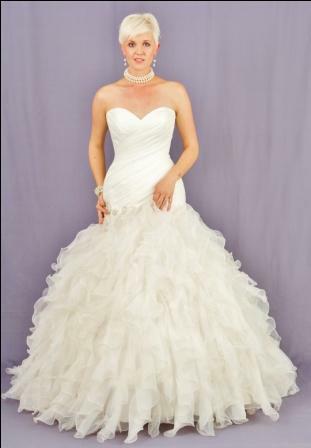 THIS BRIDAL DRESS FEATURES A MULTI LAYERED RUFFLE SKIRT AND ATTACHE CHAPEL TRAIN. VEILS, TIARAS AND JUWELLERY AVAILABLE AT YOURDAY BRIDAL. WEDDING GOWN APPOINTMENTS CAN BE MADE AT OURDAY BRIDAL STUDIO, DIRECTIONS CONTACT US ON THE WEB. CENTURION BRANCH CELL 073 299 2028 OR 012 653 0318,104 WILLEM BOTHA STREET, ELDORAIGNE centurion@yourdaybridal.co.za CLOSE TO CENTURION MALL AND MALL@REDS. Montana/Annlin Branch moved to Centurion branch. All dresses under one roof! Close to Kolonnade shopping centre and Wonderboom Junction, Pretoria North or Wonderpark shopping centre, Lynwood, Menlyn, Brooklyn, Pretoria East.